The west pier was constructed between 1890 and 1892, and the south pier between 1895 and 1897. The work was financed by Lord Robartes of Lanhydrock as recompense to the fishermen for several disastrous pilchard seasons. The old pilchard cellar and net store can still be seen. Before that it was just a little fishing cove, open to the elements and, it is said, was used in smuggling operations by the locals who had ties with the Bretons. There was also a lifeboat station here from 1867 to 1908. Up above and slightly inland from the Predannack Downs is an old airfield which became a bomber station during the second world war and then a training base for the pilots of RNAS Culdrose. The harbour was acquired by the National Trust in 1945, principally through a gift from Mr A Meyer. In addition to the harbour itself, the Trust also owns the winch house at the top of the slipway, which pre-dates the harbour walls, the small picturesque net store on the southern breakwater and the wooden fish cellar on the northern breakwater. 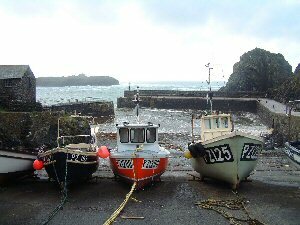 Today, the harbour still supports a small fishing community, with a few boats landing mainly crab and lobster. But it is for recreation and quiet enjoyment that most people visit the cove. The harbour is protected from the winter gales that rage across Mount's Bay by two stout sea walls. However, considerable damage to the walls has been incurred in recent years, necessitating costly repairs. Click here for a detailed history of the harbour.